நான் இலவசங்கள் கொடுப்பேன். நீ கடன்களை தள்ளுபடி செய்! Today there was a “bandh” in TamilNadu to show solidarity with the farmers who were protesting at Jantar Mantar. DMK obviously led the protest as they are desperate to score brownie points with the electorate with Jayalalitha gone. The farmers primary demand is that they need a relief package of Rs. 40,000 crores which includes loan waivers and Cauvery related issues. Their protest at Jantar Mantar was heart rending …. and drought is a reality. But behind all that is a lot of data pointing to the state’s mismanagement of the issue, starting with not saving the water when the floods happened in Dec 2015 and not caring about irrigation as a whole. It is very convenient for the state government (is there one in TN???) to let the farmers protest and make it look as though Modi and the central government doesn’t care about the TamilNadu farmers. The utterly corrupt and inefficient scum that are currently running TamilNadu think that this will win them sympathy from the voters and turn the voters against BJP. Well, scum usually occurs in stagnant pools and both the AIADMK and DMK are stagnant pools…. and the intelligent people of TamilNadu have so far left their brains behind at home when they went to vote either party to power. 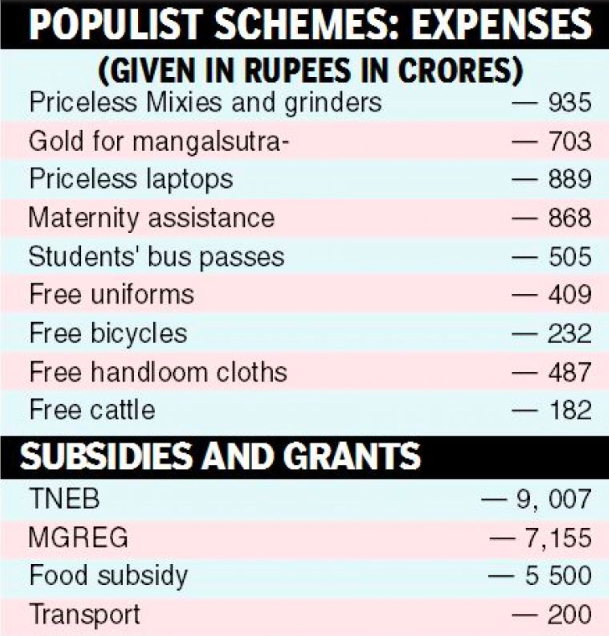 Look at what the state has been reduced to … primary education is non-existent, doles have meant that there is no skilled labour, why bother when you get everything free if you just vote one scum or the other, infrastructure is poor… the list is long and exhaustive. On every parameter, TamilNadu has been declining and will decline further if people dont wake up and smell the Kumbakonam degree coffee. The land of such greats like Bharathiyar, Anna Durai, Kamaraj, Veerapandi Kattabomman, Chidambaram Pillai (not the export from TN who helped UPA loot the nation) and the great Rajaji is struggling to find a single non-corrupt politician. Its a shame. The DMK and AIADMK have looted the state to such an extent that the black money of Delhi state residents pales in comparison. Thats what the Madhya Pradesh CM does when his state is hit by drought and what does TamilNadu government do?? Send the farmers to Jantar Mantar to protest and bring them back to do a “bandh” in the state today. Read this article on the tax collections in TamilNadu and what happens to the collections – With Rs. 2.5 lakh crore debt, TamilNadu populist schemes on the rise. The tax collection is not small, it was Rs 157,069 crore in 2015-16, but most of it is squandered away in giving doles and subsidies. Why should the centre help TamilNadu? Why should the tax payer in TamilNadu let his money be spent on doles and to line the pockets of these scum like politicians ? But who is asking…. both the DMK and AIADMK know how to beat their puny chests and wail about Tamil pride. They bring shame and talk of Tamil pride!! So while the farmers have everyone’s sympathies, their troubles are because of the state government and the centre need not and should not help. Why not ask the infamous Mannargudi Mafia “Chinnamma” and her family to return the loot and help the poor farmers? Praying for the Kumbakonam degree coffee to work tomorrow morning and for the dormant non-corrupt, hard working Tamilian inside each one of us to wake up.